I could make this really simple and say I love them. Buy them. End of story. But you probably want more details. The rubber on one of my bendy stirrups tore so I felt the need to go in search of new stirrups. I had heard a lot of good things about Jin Stirrups and the colored ones seem to be all the rage in the jumper ring. 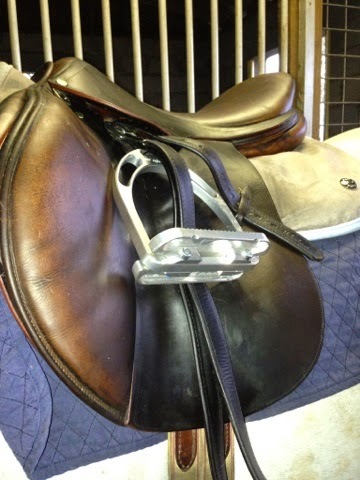 This led me to send Rachael at iselltack.com an email asking at a hefty price of $260 what makes these stirrups so great? Or lots of colors to choose from if that's your style. Here is the the description from Jin. Almost hooked... Just to be sure I asked some friends. After hearing more good feedback I was sold. One friend wasn't sure how but felt they gave her more ankle support. 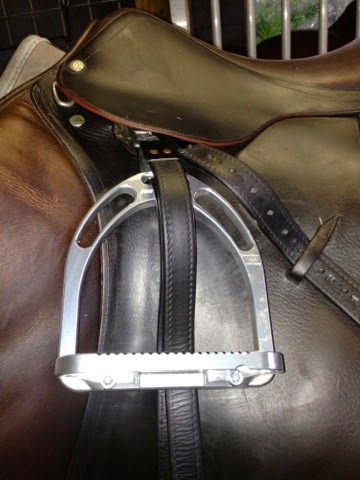 And just to persuade me more, Rachael has an offer on her website for demo stirrups priced at $195. Winner winner! I ordered these Tuesday and they arrived Friday. I went with standard silver. Although I see the colored ones showing up in the jumper ring I am not a fan of the bright colors. And what if I went in the hunter ring? When they arrived I was surprised at how big they are. Quite the size difference between old and new. I have both hacked and jumped in them and am in love. 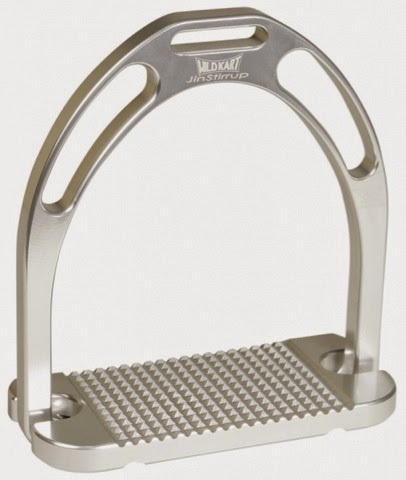 I am used to the cheese grater bottoms which provide better grip and keep your foot in the stirrup. The wider base made me feel more secure. With the old stirrup I would find they weren't always where I wanted them and would be adjusting them as I'm riding (sort of kicking the stirrup around until I got the spot I liked). I didn't do that at all with these. It was like my foot was glued to them. Husband also made the comment that they looked really nice and good quality (men love shiny metal things). They are extremely light weight. I haven't done any two point position work to see how they help ankle support yet (I will let you know next October). 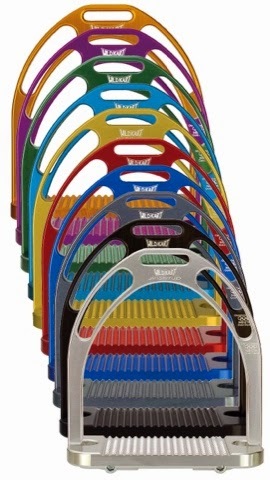 If you are in the market for new stirrups and can swing the $200 price tag by all means get these! Especially at this reduced price at iselltack.com! Verrrrrry interesting! I've seen a bunch of brightly-colored stirrups in the jumper ring, and always wondered what brand they were. While I'd stick with the traditional silver, I like the fact that they're so lightweight and "glue" your foot down: I'm a rider that is always adjusting her foot on the stirrup pad! But with a $200+ price tag? Idk if I'm convinced haha. Hmmm. I'm sort of stuck with flex stirrups. Any thoughts on how they compare? 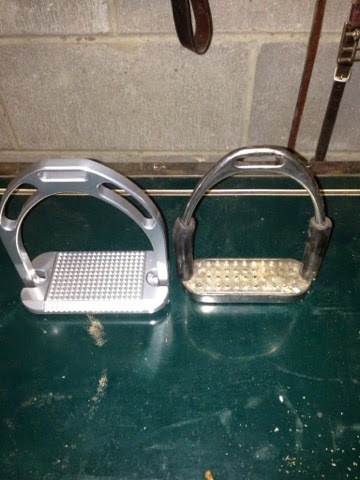 Showing I will put each stirrup on my saddle and compare! Interesting. I do that kick thing too with my foot trying to find the right spot with my stirrup. That's a lot of money for stirrups though. They look super big.. Would be interesting to try them though. I have always used just normal irons. Interesting! They are so big...that's weird to me. I would love to try them though! they're definitely large!! but i kinda like the look. right now i need too many things to splurge on stirrups (plus i honest-to-god love my compositis) - but maybe one day? I am intrigued by all these fancy stirrup options and would love anything that might help leg stability & offer better support. My issue is too much choice & lack of funds at the moment. However, I will store thus info away for future reference. Thanks!! !